Given the inherent difference in mechanical vs. silicon-based performance, spinning media often cannot deliver the I/O required of today’s virtualized, performance-oriented workloads. All-flash storage, however, provides sufficient low latency to eliminate I/O bottlenecks and raise the overall efficiency of application servers and other compute resources. 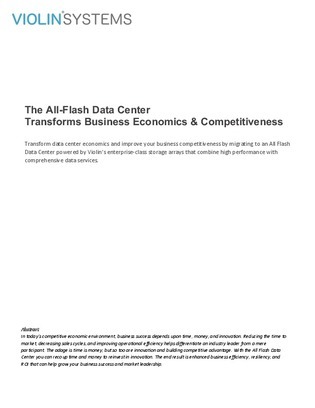 This white paper offers a comparison of the legacy vs. the all-flash data center, explains how all-flash unlocks latent data center performance, and provides steps to achieve the all-flash data center, should you choose that route. Click here to read.